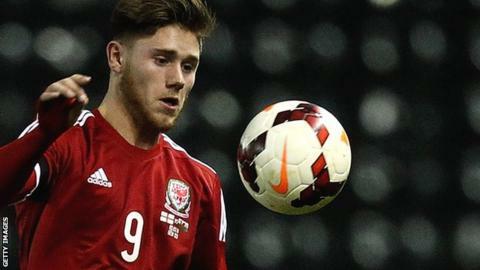 Wes Burns rescued a draw for Wales Under-21 in their Euro 2017 qualifier against Romania in Wrexham. Ionut Nedelcearu had given the visitors the lead after just two minutes at the Racecourse Ground. But Bristol City forward Burns equalised with a powerful header from Declan John's cross. Romania goalkeeper Laurentiu Branescu was sent off just before half-time for a kick on Thomas O'Sullivan, but Wales were unable to capitalise. Wales remain unbeaten after five games and stay top of Group five on 11 points, but Denmark are just a point behind and have a game in hand. Geraint Williams' side are next in action on 25 March when they travel to Bulgaria, before the return match with Romania four days later. Wales Under-21 manager Geraint Williams told BBC Radio Wales: "It's one point gained but obviously disappointed we didn't win the game. "But the conditions... were atrocious and both sets of players tried to play football in it, and ours I thought were magnificent. "If we'd taken one of the many chances we created at the start of the second half we would have got all three [points]."